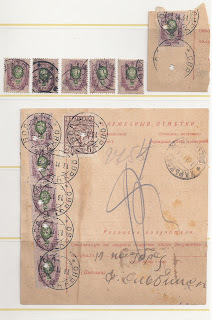 Like RSFSR Postmaster Provisional revaluation of 1920, locally produced Ukraine Trident overprints - which are also Postmaster Provisionals - are difficult to collect. But less difficult than is sometimes imagined. First of all, think about the situation which generated legitimate local tridents. Official Trident overprints came into use late in August 1918. In September, the use of unoverprinted stamps was tolerated - and mixed frankings are quite common. Only from the beginning of October were unoverprinted stamps invalid. So Postmasters had a problem only if they found themselves without (enough) Trident stamps at the beginning of October. They could put in requests for supplies and, eventually no doubt, they would get them. Meanwhile, they might decide to improvise their own local Tridents. In other words, there is no reason to expect to find a local Trident used before October 1918 and probably not much reason to expect to see them in use after say January 1919. Producing the Tridents would have been extra work for a local post office, so it is likely that most local tridents were produced in small batches. When their use came to an end, it is unlikely that there were many mint remainders which could be called in by regional or central authorities. Of course, they could ask for a new batch to be produced ( for onward transmission to philatelic agencies) or they could ask for the handstamp and then produce their own Reprints. Likewise, if philatelists turned up quickly enough at some out-of-the-way post office they might be able to get a supply of mint stamps - this clearly happened in some cases. Either way, when starting a collection of local Tridents it makes sense to avoid mint stamps since they will include Reprints, other philatelic productions and - of course - forgeries. When Dr Seichter was working on Local Trident overprints he had four problems to deal with. First, forgeries produced by Captain Schramschenko (really Scamschenko) whose handstamps had not yet been discovered and prints taken from them published. 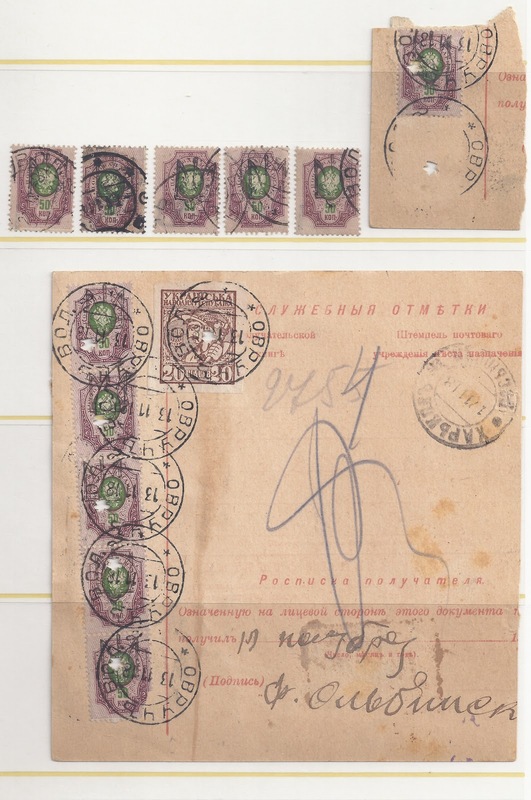 Second, forgeries produced in the Soviet Union and authenticated with a large Soviet guarantee mark which Alexander Epstein has since shown to be a forgery. Dr Seichter seems not to have known this. Third, the lack of accurate drawings and illustrations of the Tridents. Fourth, the general lack of material. The first two problems no longer exist. We can identify these forgeries quite easily. The third problem does remain. The catalogues in general use are not very helpful. We really need to see colour images with enlargements. As for the fourth problem, the solution is to make a start with the commoner local Tridents. I exclude Chernihiv (Tchernigov) and Zhitomir since these were productions of regional post and telegraph administrations (as Alexander Epstein has shown). With Ovruch one is really only dealing with one stamp and one cancellation and nothing in the holding I am illustrating here is doubtful. In contrast, Sarny stamps were used at other offices and there are more values to collect. There are also mint Reprints and lots of forgeries, mint and used. By the way, it is a good habit to try to find the cancellations used by local Trident post offices but on more common stamps, like General Issue (Shagiv) stamps. This is a good way of double checking authenticity. The more difficult local trident issues are, of course, more difficult and I will write about this in my next Blog.